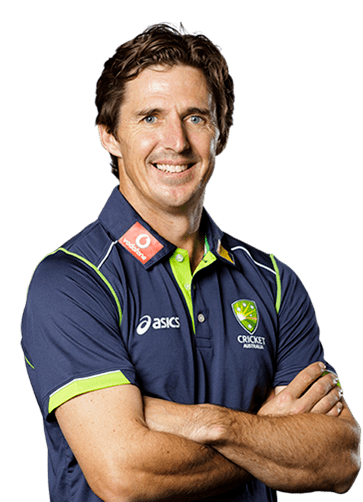 George Bradley "Brad" Hogg (born 6 February 1971) is an Australian cricketer. He is a left-arm chinaman bowler, and a lower-order left-handed batsman. His earlier international career was revitalised by Shane Warnes absence from cricket in 2003 due to suspension from a drugs test and subsequent retirement from one-day cricket. He is Australias sixth most successful One Day International bowler and second most successful spinner in terms of wickets taken. He was a member of Australias victorious 2003 and 2007 Cricket World Cup teams and is one of only 15 players to have won the Cup more than once. He retired from International cricket on 4 March 2008 after the 2007-08 Commonwealth Bank Series. Hogg also enjoys a career as cricket commentator and has become a popular media personality between cricket commitments. Hogg grew up on a sheep farm in Williams, Western Australia and is a former pupil of Aquinas College, Perth. Later, he completed a Bachelor of Commerce majoring in Accounting & Marketing at Curtin University. Hogg made his first-class cricket and domestic limited overs debut for Western Australia in February 1994 as a middle order batsman. He didnt begin to bowl left-arm wrist-spin until former Australian test leg-spinner Tony Mann asked him to bowl them in the nets as preparation for the batsmen to face NSW spinner David Freedman. In 1999 he made a brief foray in umpiring Australian rules football, making his way up to Westar Rules Colts (under 18) level. In 1996, he was selected in the Australian team to tour India as a replacement for Warne who was injured. He made his Test debut against India in Delhi, taking 1/69 and making 1 and 4. He also played seven One Day International matches. However, the belief at the time was that he was merely a place-holder for Warne and he was discarded from the international squad for some time. Hogg was also in and out of the Western Australian squad for the next few years as he struggled to come to terms with unsympathetic pitches and poor returns with the ball. Hogg was absent from the international scene until called up to replace Warne during the 2002-03 VB Series (an annual tri-nations one day tournament in Australia) after Warne injured his shoulder. However, Warne then tested positive to a banned diuretic in a pre-World Cup drugs test, leaving Hogg to play as Australias specialist spinner in Australias Cup winning side and filled that role until his own retirement, this was due to Warnes retirement from the one day game. Hogg was recalled to the Australian Test team to tour the West Indies in April 2003, where he played two matches (making his wait between his first and second Tests of seven years and 78 games the longest for an Australian). He also played against Zimbabwe at the SCG later that year, but was upstaged by part-time chinaman bowler Simon Katich, who took 6/90 for the match (Hogg took 3/119). He was left out of the Test team in 2004 but remained in the national one day team as the preferred spinner to Stuart MacGill. In 2005-06 he became a one-day only player with Western Australian selectors preferring to play young spinner Beau Casson ahead of Hogg in the states Pura Cup side. However, with Cassons move to New South Wales in 2006-07, Hogg has regained his place in the first-class side. In 2007-08, after a four year layoff, Hogg was recalled to Test cricket to play against India after Stuart MacGill had to withdraw from the team due to suffering from carpal tunnel syndrome in his bowling hand. On 2 January 2008, Hogg scored a Test-career-best 79 as part of a 173-run partnership with Andrew Symonds—a 7th wicket record for both the Sydney Cricket Ground and Australia vs. India. Hoggs highest ODI score is 71 not out against England, and his best bowling figures in an innings are 5/32 against the West Indies. Hogg is a noted fitness fanatic, scoring the highest beep test result in the Australian team in 2005, with a score of 14.6. On 27 February 2008 Hogg announced his retirement from international cricket, effective after the Commonwealth Bank Series. His test career (17 wickets at 54.88) was ultimately unremarkable, but his 156 One Day International wickets at 26.84 coupled with useful lower-order batting placed him among Australias best one-day players. On 4 November 2011 Hogg signed with the Perth Scorchers, one of the franchises in the Australian domestic Twenty20 competition, the Big Bash League. He took 12 wickets in the tournament at an average of 13.5, better than any other spinner in the competition bettered in wickets only by James Faulkner and Rana Naved-ul-Hasan. On 23 January 2012, on the back of his form with the Scorchers, Hogg earned a recall to the Australian Twenty20 squad. He was also picked up by Sylhet Royals for the inaugural Bangladesh Premier League, the Nashua Mobile Cape Cobras for the South African T20 League, the Rajasthan Royals in the Indian Premier League players auction, and the Sri Lanka T20 Tournaments. On 1 February 2012, Hogg returned to international cricket at the Sydney Olympic Stadium in a Twenty20 international against India, returning figures of one wicket (that of Virat Kohli) for 21 runs from four overs. In the second match of the Twenty20 series at the Melbourne Cricket Ground, he took the wicket of Virender Sehwag in his first over, and ended up with bowling figures of 1/19. He is one of the few bowlers who bowls left-arm wrist spin in international cricket. He has an excellent wrongun and a well-disguised flipper, which he used to bowl Andy Flower, who was then considered to be one of the worlds best at playing spin bowling, during the 2003 World Cup. In his book, Walking to Victory, Adam Gilchrist described it as "one of the balls of the tournament." During the 2007 Cricket World Cup Hogg beat Andrew Flintoff with two consecutive wronguns, with the second one resulting in Flintoff being given out stumped. Hogg is well known for his use of his tongue while bowling, poking it out just before he bowls, which was considered his trademark. During the second test against India in Sydney it was alleged that Hogg called the Indian captain Anil Kumble and vice-captain Mahendra Singh Dhoni "bastards". Hogg faced a ban of between two and four Test matches after being charged with the level three offence under the International Cricket Councils Code of conduct which refers to abuse by reference to a players "race, religion, gender, colour, descent, or national or ethnic origin." The hearing was set to take place on 14 January in Perth however the BCCI dropped the charges a few days later.